در منطقه بشگز در 50 کیلومتری شمال‌‌‌‌‌‌‌‌ باختر سربیشه و در حاشیه خاوری بلوک لوت،‌ واحدهای گدازه‌‌ای ترشیری با ترکیب آندزیت ‌‌‌‌بازالتی، آندزیت و داسیت رخنمون دارند. بافت چیره این سنگ­ها،­ پورفیری با زمینه میکرولیتی- شیشه‌‌‌‌‌‌‌‌‌‌‌‌‌‌‌‌‌‌‌‌‌ای، گلومروپورفیری و حفره‌ای است. کانی‌‌‌‌های اصلی در گدازه­های آندزیتی شامل پلاژیوکلاز، پیروکسن، آمفیبول، بیوتیت و در داسیت­ها شامل پلاژیوکلاز، کواتز، آمفیبول و بیوتیت هستند. بررسی‌‌های ژئوشیمیایی نشان می‌‌‌دهد که این سنگ‌‌ها، ماهیت کالک‌آلکالن پتاسیم متوسط تا بالا دارند. غنی‌شدگی Sr، Zr، Cs، Th، K، تهی‏شدگی Nb، Ti، P، Ba و غنی­شدگی LREE نسبت به HREE در نمونه‌های بررسی شده، بیانگر شکل‌‌‌‌‌گیری آنها در محیط وابسته به فرورانش و حاشیه فعال قاره­ای است. بر پایه نمودار نسبت‌های عناصر کمیاب، سنگ‌‌های آتشفشانی منطقه بشگز در گستره کمان‌های آتشفشانی جوان یا مراحل آغازین فرورانش واقع شده‌اند. میزان Mg# در سنگ‌‌های آتشفشانی منطقه بشگز به‏طور میانگین حدود 48 است که بیانگر نقش اجزای گوشته‌ای در تشکیل آنهاست. نسبت­ پایین Sm/Yb (کمتر از 5/2) در گدازه­های بررسی ­شده، بیانگر نبود گارنت در منشأ است. نسبت پایین Zr/Ba (میانگین34/0) و نسبت La/Nb بالا (19/3-22/2) در گدازه­های منطقه مورد مطالعه، نشان‎‌دهنده خاستگاه گوشته سنگ‏کره‎ای است. نمودارهای نسبت MREE/HREE، نشان از این دارد که گدازه­های منطقه بشگز در قلمرو رخساره اسپینل ‎لرزولیت فلوگوپیت‌‌‌‌‌‌‌‌‌‌‌‌‌‌دار جای می‌گیرند. نسبت پایین Ba/Rb (20<) و نسبت‌ بالای Rb/Sr (1/0>)، حضور فلوگوپیت را در منشأ تایید می­کند. الگوی یکنواخت عناصر خاکی کمیاب و مقادیر متوسط LaN/LuN (14-8) در سنگ­های حدواسط و اسیدی بشگز، بیانگر ارتباط ژنتیکی آنهاست. Boshgaz area are formed in an immature arc or early stage of subdution. that lavas of the Boshgaz area originated from spinel-phlogopite lherzolite. acidic rocks of Boshgaz indicate genetic relationbetween them. بیانی، ر.، 1394- پترولوژی سنگ‌‌های آتشفشانی ترشیری منطقه شوشک (شرق سربیشه) با نگرشی بر پتانسیل اقتصادی آنها، پایان‌نامه کارشناسی ارشد پترولوژی، دانشگاه بیرجند، 131ص. پارسایی، م.، 1391- مطالعه زمین‌‌شناسی، دگرسانی و پترولوژی سنگ‌‌های آذرین خاور مود (جنوب خاور بیرجند)، پایان‌نامه کارشناسی ارشد پترولوژی، دانشگاه بیرجند، 115ص . چهکندی‌نژاد، م.، 1394- پترولوژی سنگ‌‌های آتشفشانی ترشیری منطقه آسفیچ (جنوب باختر سربیشه) با نگرشی بر پتانسیل اقتصادی آنها، پایان‌نامه کارشناسی ارشد پترولوژی، دانشگاه بیرجند، 84 ص. گودرزی، م.، محمدی، س. س. و زرین‌کوب، م. ح.، 1393- سنگ‌شناسی، ژئوشیمی و جایگاه زمین‎ساختی سنگ‌‌های آتشفشانی ترشیری سلم‌آباد (جنوب خاور سربیشه)، خاور ایران. مجله زمین‌‌شناسی اقتصادی، جلد 6، شماره 2، صص. 217 تا 234. محمدی، س. س.، 1391- مطالعه زمین‌‌شناسی و پترولوژی سنگ‌‌های آتشفشانی ترشیری منطقه معدن پرلیت سربیشه با نگرشی بر کاربرد صنعتی آن. مجله زمین­شناسی اقتصادی، جلد4، شماره 1، صص. 59 تا 76. مکی­پور، م.، 1391- مطالعه زمین­شناسی، دگرسانی و پترولوژی سنگ‌‌های آذرین منطقه گلاب (سربیشه، خاور ایران)، پایان‌نامه کارشناسی ارشد پترولوژی، دانشگاه بیرجند، 117ص. ملکیان دستجردی، م.، 1394- پترولوژی سنگ‌‌های آتشفشانی منطقه کنگان (شمال شرق سربیشه)، استان خراسان جنوبی، با نگرشی بر اهمیت اقتصادی آنها، پایان‌نامه کارشناسی ارشد پترولوژی، دانشگاه بیرجند، 131ص. ملکیان دستجردی، م.، محمدی، س.س.، نخعی، م. و زرین‌کوب، م. 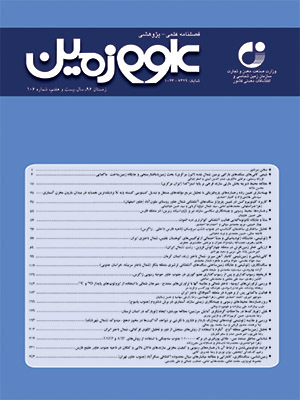 ح.، 1395- ژئوشیمی و جایگاه تکتونوماگمایی سنگ­های آتشفشانی ترشیری منطقه کنگان، شمال خاور سربیشه، خراسان جنوبی، مجله زمین شناسی اقتصادی، جلد 8، شماره 2، صص. 553 تا 568. نظری، ح. و سلامتی، ر.، 1378- نقشه زمین‌‌شناسی 1:100000 چهارگوش سربیشه، سازمان زمین‌‌شناسی و اکتشافات معدنی کشور. نظری، ز.، 1390- بررسی زمین‌‌شناسی و پترولوژی سنگ‌‌های آتشفشانی شمال باختر سربیشه )خاور ایران)، پایان‌نامه کارشناسی ارشد پترولوژی، دانشگاه بیرجند، 123 ص.
Aldanmaz, E., Pearce, J. A., Thirlwall, M. F. and Mitchell, J. G., 2000- Petrogenetic evolution of late Cenozoic, postcollision volcanism in western Anatolia, Turkey. Journal of Volcanology and Geothermal Research 102: 67– 95. Alici, Sen P., Temel, A. and Gourgaud, A., 2004- Petrogenetic modeling of Quaternary postcollisional volcanism: a case study of central andeastern Anatolia. Geological Magazine 141: 81-98. Almeida, M. E., Macambira, M. J. B. and Oliveira, E. C., 2007- Geochemistry and zircon geochronology of the I-type high-K calc-alkaline and S-type granitoid rocks from southeastern Roraima, Brazil: Orosirian collisional magmatism evidence (1.97-1.96 Ga) in Central portion of Guyana shield. Precambrian Research 15: 69-97. Arjmandzadeh, R. and Santos, J. F., 2014- Sr-Nd isotope geochemistry and tectonomagmatic setting of the Dehsalm Cu-Mo porphyry mineralizing intrusives from Lut Block, eastern Iran. Int J Earth Sci (Geol Rundsch) 103: 123-140. Arslan, M. and Aslan, Z., 2006- Mineralogy, petrography and whole-rock geochemistry of the Tertiary granitic intrusions in the Eastern Pontides, Turkey. Journal of Asian Earth Sciences 27: 177-193. Aydınçakır, E., 2016- Subduction-related Late Cretaceous high-K volcanism in the Central Pontides orogenic belt: constraints on geodynamic implications. Geodinamica Acta 28: 1-33. Boynton, W. V., 1984- Geochemistry of the rare earth elements: meteorite studies. Rare Earth Element Geochemistry 16: 63-114. Brown, G. C., Thorpe, R. S. and Webb, P. C., 1984- The geochemical characteristics of granitoids in contrasting arcs and comments on magma sources. Journal of Geological Society London 141: 413-426. Camp, V. E. and Griffis, R. J., 1982- Character, genesis and tectonic setting of igneous rocks in the Sistan suture zone, eastern Iran. Lithos 15: 221-239. Castillo, P. R., 2006- An overview of adakite petrogenesis: Chinese Science Bulletin 51: 257-268. Chashchin, A. A., Sorokin, A. A., Lebedev, V. A. and Blokhin, M. G., 2016- Age, Main Geochemical Characteristics, and Sources of Late Cenozoic Volcanic Rocks in the Udurchukan Volcanic Area (Amur Region), published in Tikhookeanskaya 35: 3-13. Chen, L., Zheng, Y. F. and Zhao, Z. F., 2016- Geochemical constraints on the origin of Mesozoic andesites from the Ningwu basin in the Middle-Lower Yangtze Valley, South China. Lithos 254: 94-117. De Angelis, S. H., Larsena, J., Dunna, A. and Haydenc, L., 2015- Amphibole reaction rims as a record of pre-eruptive magmatic heating: An experimental approach. Earth and Planetary Science Letters 426: 235-245. Esmaeily, D., Nedelec, A., Valizadeh, M. V., Moore, F. and Cotton, J, 2005- Petrology of the Jurassic Shah-Kuh granite (eastern Iran), with reference to tin mineralization. Journal of Asian Earth Sciences 25: 961-980. Fu, D., Bo, H., Songbai, P., Timothy, M. K., Wenxiao, Z. and Mengchun, G., 2016- Geochronology and Geochemistry of Late Carboniferous Volcanic Rocks from Northern Inner Mongolia, North China: Petrogenesis and Tectonic Implications. Gondwana Research 36: 545-560. Furman, T. and Graham, D., 1999- Erosion of lithospheric mantle beneath the East African Rift system: geochemical evidence from the Kivu volcanic province. Developments in Geotectonics 24: 237-262. Geng, H., Sun, M., Yuan, C., Xiao, W. J., Xian, W. S., Zhao, G. C., Zhang, L. F., Wong, K. and Wu, F. Y., 2009- Geochemical, Sr–Nd and zircon U–Pb–Hf isotopic studies of Late Carboniferous magmatism in the West Junggar, Xinjiang: implications for ridge subduction?. Chemical Geology 26: 364–389. Gorton, M. P. and Schandl, E. S., 2000- From continental to island arc: A geochemical index of tectonic setting for arc - related and within plate felsic to intermediate volcanic rocks. The Canadian Mineralogist 38:1065- 1073. Goss, A. R. and Kay, S. M., 2009- Extreme high field strength element (HFSE) depletion and nearchondritic Nb/Ta ratio in Central Andean adakite-like lavas ( 28°S, 68° W). Earth and Planetary Science Lettres 279: 97-109. Gusev, A. I. and Korobeinikov, A. F., 2009- Mantle–crustal interaction in the generation of different types of mineralization: geophysical and petrological aspects, Izv. Tomsk. Politekhn.Unive 315(1): 18-25. Helvaci, C., Ersoy, E. Y., Sözbilir, H., Erkül, F., Sümer, Ö. and Uzel, B., 2009- Geochemistry and 40Ar/39Ar geochronology of Miocene volcanic rocks from the Karaburun Peninsula: Implications for amphibole-bearing lithospheric mantle source, Western Anatolia. Journal of Volcanology and Geothermal Research 185: 181–202. Karimpour, M. H., Stern, C. R., Farmer, L., Saadat, S. and Malekzadeh, A., 2011- A review of age, Rb-Sr geochemistry and petrogenesise of Jurassic to Quaternary igneous rocks in Lut block, Eastern Iran. Journal of Geopersia: 19-36. Karsli, O., Dokuz, A., Uysal, I., Kandemir, R. and Wijbrans, J., 2010- Generation of the Early Cenozoic adakitic volcanism by partial melting of mafic lower crust, Eastern Turkey: Implications for crustal thickening to delamination. Lithos 114: 109-120. Kürkcüoglu, B., 2010- Geochemistry and petrogenesis of basaltic rocks from the Develida_g volcanic complex, Central Anatolia, Turkey. Journal of Asian Earth Sciences 37, 42-51. Kuscu, G. G. and Geneli, F., 2010- Review of post-collisional volcanism in the central Anatolian volcanic province (Turkey), with special reference to the Tepekoy volcanic complex. International Journal of Earth Sciences 99: 593-621. Le Maitre, R. W., 2002- Igneous rocks: a classification and glossary of terms: recommendations of the International Union of Geological Sciences. Subcommission on the Systematics of Igneous Rocks. Cambridge University Press: 236p. Lee, C. T. A. and Bachmann, O., 2014- How Important Is the Role of Crystal Fractionation in Making Intermediate Magmas? Insights from Zr and P Systematics. Earth and Planetary Science Letters 393: 266-274. Litvak, V. D., Spagnuolo, M. G., Folguera, A., Poma, S., Jones, R. E. and Ramos, V. A., 2016- Late Cenozoic calc-alkaline volcanism over the Payenia shallow subduction zone, South-Central Andean back-arc (34°30’-37°S), Argentina. Journal of South American Earth Sciences 64:365-380. McArthur, A. N., Cas, R. A. F. and Orton G. J., 1998- Distribution and significance of crystalline, perlitic and vesicular textures in theOrdovician Garth Tuff (Wales). Bulletin of Volcanology 60: 260–285. McDonough, W. F. and Sun, S. S., 1995- Composition of the Earth. Chemical Geology 120: 223–253. Müller, D., Rock, N. M. S. and Groves, D. I., 1992- Geochemical discrimination between shoshonitic and potassic volcanic rocks in different tectonic settings: a pilot study. Mineralogy and Petrology 46: 259–289. Olafsson, M. and Eggler, D. H., 1983- Phase relations of amphibole, amphibole-carbonate and phlogopite-carbonate peridotite: petrologic constraints on the asthenosphere: Earth and Planetary Science Letters 64: 305-315. Pearce, J. A., 1983- Role of the sub-continental lithosphere in magma genesis at active continental margins. In: Continental basalts and mantle xenoliths (Eds. Hawkesworth, C. J. and Norry, M. J.). Shiva, Nantwich: 230-249. Pearce, J. A., 2008- Geochemical fingerprinting of oceanic basalts with applicationsto ophiolite classification and the search for Archean oceanic crust. Lithos 100:14–48. Peccerillo, A. and Taylor, S. R., 1976- Geochemistry of Eocene calc-alkaline volcanic rocks from the Kastamonu area, northern Turkey. Contributions to Mineralogy and Petrology 58: 63–81. Prouteau, G., Scaillet, B. and Pichavant, M., Maury R., 2001- Evidence for mantle metasomatism by hydrous silicic melts derived from subducted oceanic crust: Nature 410: 197-200. Rollinson, H., 1993- Rising geochemical data:evaluation, presentation, interpretation. Longman John Wiley and Sons, New York, 352 p.
Sharma, M., 1997- Siberian traps. In: Large Igneous Provinces: Continental, Oceanic, and Planetary Flood Volcanism (Eds. Mahoney, J. J. and Coffin, M. F.). American Geophysical Union: 273-295. Siddiqui, R. H., Asif Khan, M. and Qasim Jan, M., 2007- Geochemistry and petrogenesis of the Miocene alkaline and sub-alkaline volcanic rocks from the Chagai arc, Baluchistan, Pakistan: Implications for porphyry Cu-Mo-Au deposits: Himalayan Earth Sciences 40: 1-23. Sun, S. S. and McDonough, W. F., 1989- Chemical and isotopic systematic of ocenic basalts: implications for mantel compositions and processes In: Sanders A.D. and Norry M.J. (Eds), Magmatism in Ocean basins. Geological Society London Special Publications 42: 313-345. Terentiev, R. A., Savko, K. A. and Santosh, M., 2016- Paleoproterozoic crustal evolution in the East Sarmatian Orogen: Petrology, geochemistry, Sr-Nd isotopes and zircon U-Pb geochronology of andesites from the Voronezh massif, Western Russia. Lithos 246-247: 61-80. Thirlwall, F. M., Upton, B. G. J. and Jenkins, C., 1994- Interaction between continentam lithosphere and Iceland plume-Sr–Nd–Pb isotope geochemistry of Tertiary basalts, NE Greenland. J. Petrol, 35: 839–879. Tirrul, R., Bell, L. R., Griffis, R. J. and Camp, V. E., 1983- The Sistan suture zone of eastern Iran. Geological Society of America bulletin 84:134-140. Ustunisik, G., Attila, K. and Roger, L. N., 2014- New Insights into the Processes Controlling Compositional Zoning in Plagioclase. Lithos 200: 80-93. Wilson, M., 1989- Igneous petrogenesis a global tectonic approach: Department of earth Science. University of leeds: 466. Winter, J. D., 2001- An introduction to igneous and metamorohic petrology. Prentice Hall publication, New Jersey, 699p. Withney, D. and Evans, B., 2010- Abbreviations for names of rock-forming minerals, American Mineralogist 95: 185–187. Yang, W. and Li, Sh., 2008- Geochronology and geochemistry of the Mesozoic volcanic rocksin Liaoning: Implications for lithospheric thinning of the North China Craton. Lithos 102: 88-17. Yu, Q., Ge, W.C., Zhang, J., Zhao, G. C., Zhang, Y. L. and Yang, H., 2016- Geochronology, Petrogenesis and Tectonic Implication of Late Paleozoic Volcanic Rocks from the Dashizhai Formation in Inner Mongolia, Ne China. Gondwana Research 47: 164-177. Zhu, W. G., Zhong, H., Li, Z. X., Bai, Z. J. and Yang, Y. J., 2016- SIMS zircon U–Pb ages, geochemistry and Nd–Hf isotopes of ca. 1.0 Gamafic dykes and volcanic rocks in the Huili area, SW China: Origin and tectonic significance. Precambrian Research 237: 67-89.